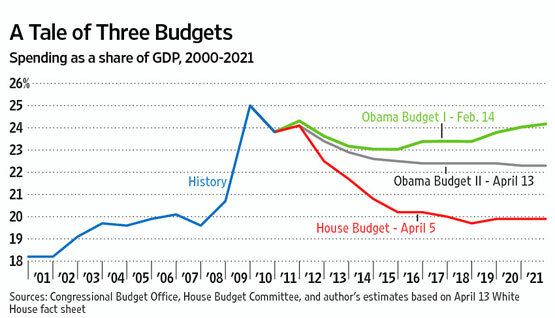 This chart from the 4/21 Wall Street Journal puts the budget battle in perspective. It's puzzling why President Obama even bothered to offer a second, revised budget plan (the one he announced in a campaign-style speech, with few details, at George Washington University on April 13th). Double the tax hikes from his first budget (i.e., $3 trillion in higher taxes instead of $1.5 trillion). Let the national debt keep growing, to a staggering 77% of the economy by 2021. Even Democratic graybeard Erskine Bowles, who chaired Mr. Obama's recent deficit commission, felt compelled to dismiss Mr. Obama's budget(s) as woefully insufficient to meet the enormous fiscal challenges facing the nation. In short, Mr. Obama is running for reelection on a platform of permanently higher taxes and spending, with even deeper Medicare cuts than Republicans have proposed over the coming decade, while trying to pass it all off as "fiscal prudence" with "compassion." It displays neither prudence nor compassion. True compassion (for future generations) would dictate that the President offer a third, this-time-serious budget -- a budget at least as compassionate as the one that passed the House. For a more defailed comparison, see our handy one-page report card. TAKE ACTION: Tell Congress: "No Debt Ceiling Hike Unless You 'Cut, Cap & Balance Federal Spending!"